You want to place a call (a "call out") from any phone — land line or cell — but you want the Caller ID to show your Keypad number. Easy! First, make sure you've given permission to this number in your Office Directory. (If it's not listed, you need to create an entry for it by adding a new office number.) 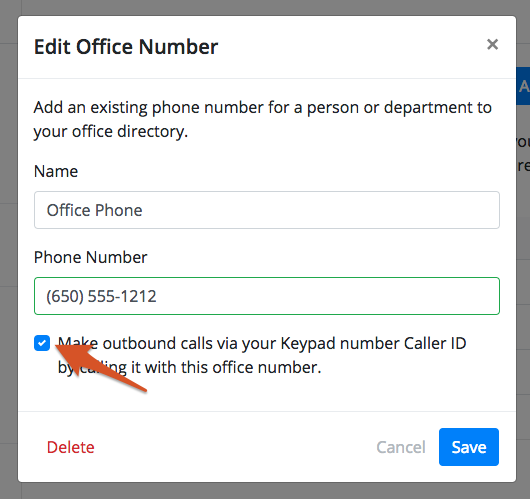 Select the checkbox, Make outbound calls via your Keypad number Caller ID by calling it with this office number. Once you've done this, you can call from that phone. Dial your Keypad number from any phone. You will hear "Please enter the number you would like to call, followed by the pound (#) key." The receiver will get a call from you. The caller ID will show your Keypad number. Note: Grasshopper calls this feature "Call Out".